Remember when I was complaining that I couldn’t find any superhero underwear for Ninjette? I scrounged the interwebs for it and then it led me to almost make our own underwear. I was about to take orders when I realized that the sewing pattern was a bit harder than that pillow I once sewed in seventh grade. I resorted to buying a few superhero ones from the “boy” section. In my search, I wondered why there wasn’t anyone selling clothing (or underwear!) that broke down those gendered stereotypes. Everywhere I went, I only saw princesses, flowers, kittens, and the like for girls. Where were the dump truck shirts for the girls? How come only boys had them? My daughter loved cars, construction vehicles, rockets AND she loved princesses, flowers, and kittens. When Ninjette was a baby, I think this gendered stereotyping was worse. She had a closet full of ruffles, sparkles and everything was usually pink. I wanted Ninjette to have a wide array of colors and for her to know that it was cool to like things that this world stereotypes as “boy” things. She could like whatever she wanted to fancy. Well, my good friend introduced me to Baby Blastoff!’s Emily Bennett. I immediately wondered, “Where was she when Ninjette was a baby? !” Emily launched a Kickstarter recently to get Baby Blastoff! to a huge trade show in NYC. It will help them to connect to wholesale buyers outside of their New Mexico headquarters so that these clothes can be readily available for EVERYONE. How cool would that be? Next time I need to go get a baby shower, birthday or holiday gift, I could pick up one of these super-cool tees for my niece who loves firetrucks or for my godson who loves cats. Emily was so gracious enough to send over some onesies to me so that I can outfit all the babies with these empowering, stereotype-busting clothes! Check out her Kickstarter campaign and contribute to make this happen! Do it now because the campaign is over October 2 – I’ll wait…. Emily tells me, “Designing to break down stereotypes for boys is much more challenging, as people often seem more uncomfortable with questioning male gender stereotypes. Pushing out the options for boys is really important to me. So this cat is about that.” I definitely agree with her on that! I also think this would be a really great onesie for a girl, too. After all, what boy or girl doesn’t like stars? My favorite onesie, thus far, is this amazing one called “Like Toadally.” What do you think? I love the toad and the little speckled hearts! 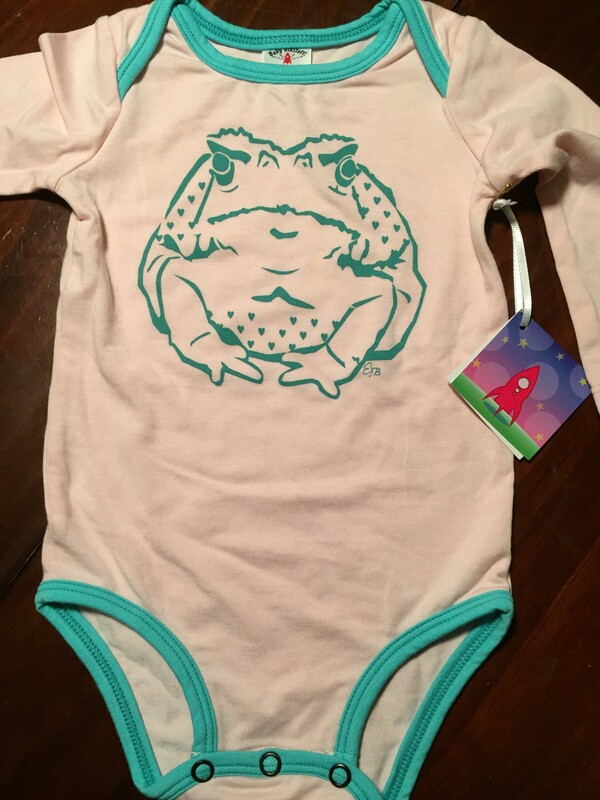 “Like Toadally” Onesie by Baby Blastoff! And finally, elephants. I love elephants and this is just perfect! I wish they had one in an adult size? 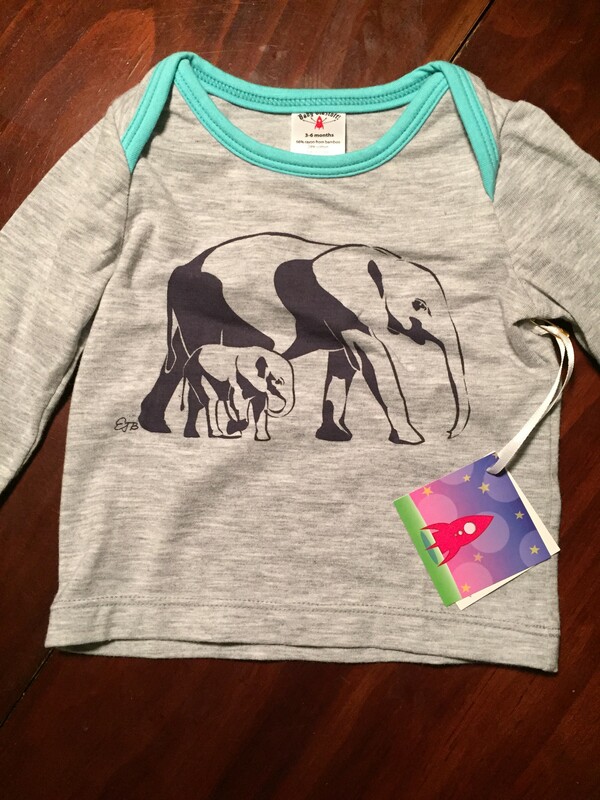 “Very Relephant” by Baby Blastoff! Aren’t these so great? I’m going to relish in my uber-cool hipster auntie status with these clothes! 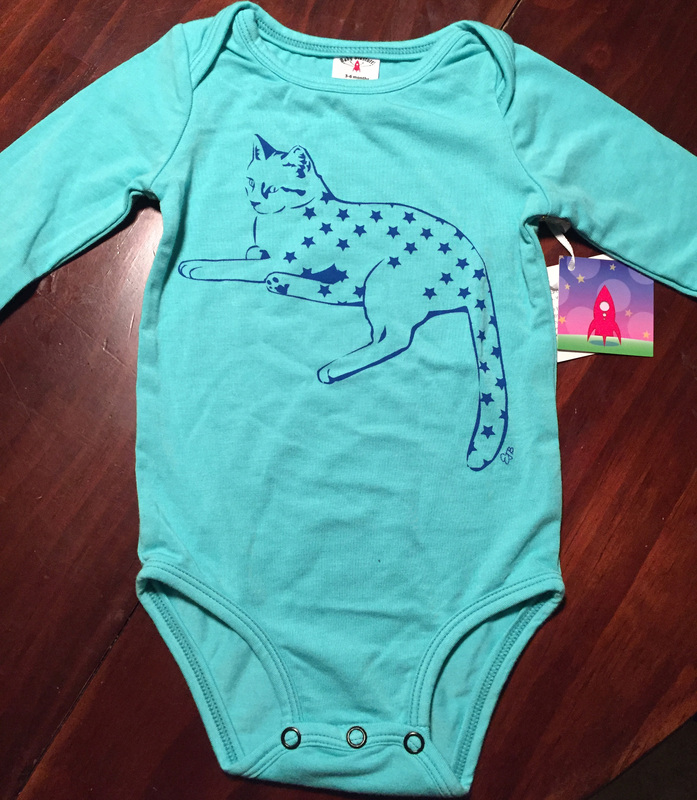 You can get some of these super cool clothes by backing Baby Blastoff! over at Kickstarter today. Empower the little ones in your life through their fashion!